The Dish Anywhere app now brings the live TV and DVR recordings for Android TV. If you are a Dish Network subscriber using a smart TV or another device with Android TV, your life will become much easier. 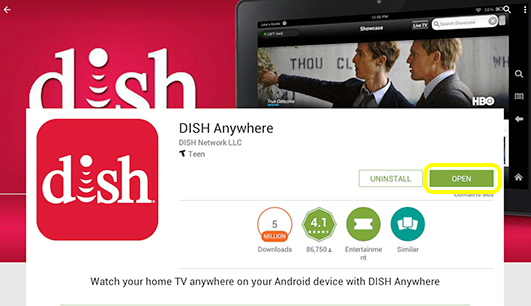 On Wednesday, May 2, Dish announced that the free Dish Anywhere app is now available on the Android TV platform. Dish Anywhere has been available for mobile devices since 2013, allowing subscribers to watch live television, their DVR records and on-demand content anywhere. It is not limited either: 100 percent of the content available in your subscription is available through the application, so you do not have to worry about the selection being restricted depending on where you are when you look. The new Android TV application provides a 10-foot viewing experience, which means that the user interface is readable and easy to use from your couch. "Multimedia players provide easy access to video content, so it's not surprising that a third of US broadband homes own these devices," Dish's vice president of product management said in a statement. Niraj Desai By expanding the Dish Anywhere application to Android TV, we're giving our customers more ways to see their content on devices they already own, at no additional cost. " To view live TV, recorded or on-demand content through Dish Anywhere, you will need a compatible decoder model. The Hopper 3, Hopper with Sling and first-generation Hopper or compatible VIP receivers connected to a Sling adapter are compatible. Even if you do not have any compatible hardware, you can still watch content on demand through Dish Anywhere, as long as you are a current subscriber. Compatible Android TV devices, including smart TVs that run on the Sony and Sharp platforms, as well as media players such as AirTV Player, Xiaomi Mi Box and Nvidia Shield TV. Dish Anywhere is also available in the Dish Evolve decoder, which you will find in some hotel rooms. This is useful, as it allows you to watch your DVR recordings directly on the TV in the hotel room. The Dish Anywhere application can be downloaded for free from the Google Play Store and is also available for Amazon Fire TV devices. If this has you considering Dish, but you are currently competing with a service, check out our comparison of Dish Network and DirecTV.